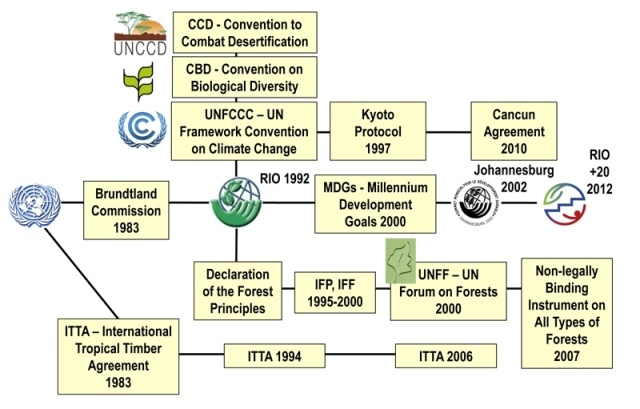 As early as the 1960s, the international forestry community had identified policy planning as a priority, recognizing the importance of having sound policy to guide efforts to improve the forest sector's performance in countries and provide more strategic orientation towards forest development. In the 1980s, in response to worldwide concern over deforestation in the tropics, it initiated the first set of internationally concerted action plans, including tropical forest action plans (TFAPs), forestry sector master plans and forestry sector reviews. The lessons learned from TFAPs and other planning frameworks had significant impact on the subsequent international forest policy dialogue. "reviewing and, if necessary, revising measures and programmes relevant to all types of forests and vegetation, inclusive of other related lands and forest based resources, and relating them to other land uses and development policies and legislation". The Intergovernmental Forum on Forests (IFF), a successor to IPF, reconfirmed that NFPs were a viable framework for implementing the Proposals for Action in a holistic, comprehensive and multisectoral manner. “develop, implement, publish and, as necessary, update national forest programmes or other strategies for sustainable forest management which identify actions needed and contain measures, policies or specific goals”. Mechanisms have emerged to support implementation of NFPs in countries, such as the World Bank’s Program on Forests (PROFOR) which began in the late 1990s, and the National Forest Programme Facility, launched in 2001 and hosted by FAO.